I'm not your cereal & milk for breakfast kind of a girl. I need more substance. 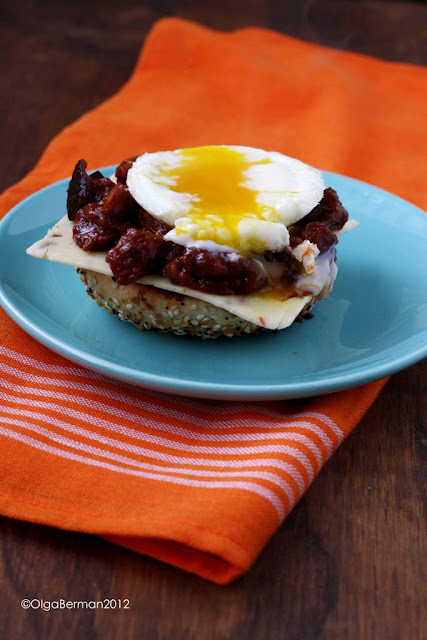 In fact, I don't mind eating leftovers for breakfast once in a blue moon: think soup, pizza, or even half a burger! As far as the "normal breakfast," bagels with cream cheese and smoked salmon are one of my favorites, but they do get old. 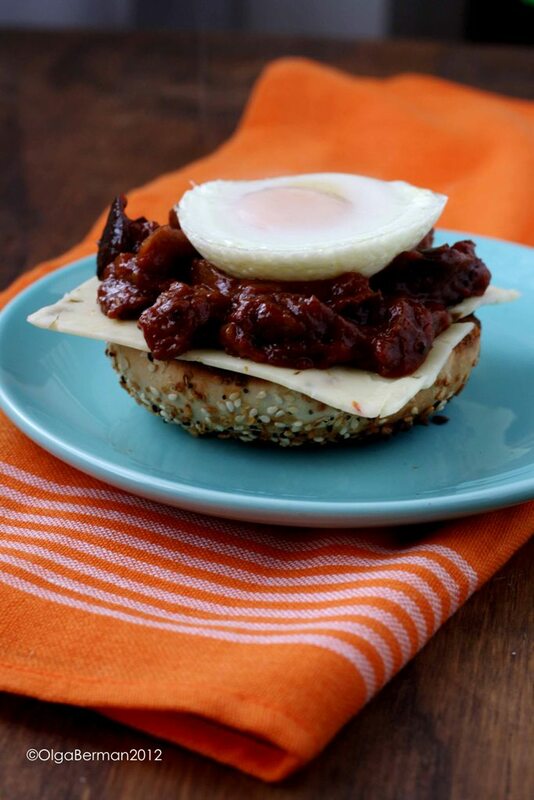 A few weekends ago I decided to have a bagel with a few atypical toppings: eggplant, cheese (ok, that's not that different) and a poached egg. 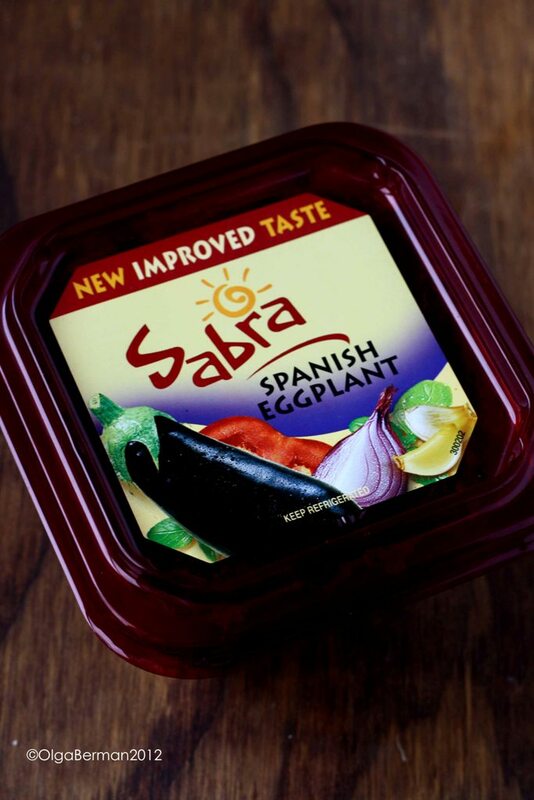 For the eggplant part, I used Sabra's Spanish Eggplant that I received as being part of Sabra's Tastemakers Program. Before visiting the Sabra factory in Richmond, VA, I had no idea Sabra makes vegetarian sides like this one. The Spanish Eggplant is a "delicious mix of all-natural ingredients, including eggplant, tomatoes, onion, and garlic. Simmered in a tangy tomato sauce, this classic blend of veggies makes a lovely appetizer or intriguing addition to any meal." 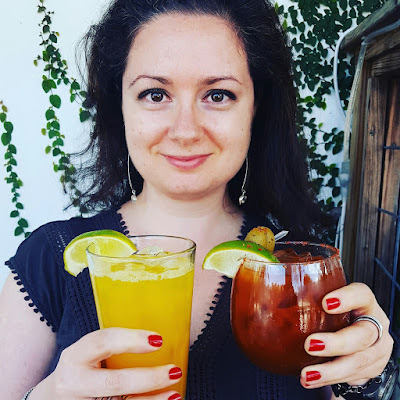 If you can't find the Spanish Eggplant at your grocery store, just make something similar at home! 1. Assemble: bagel, cheese, eggplant, egg. I decided to have this as an open sandwich, but you can do as you please! This is a messy dish to eat for sure, but who cares? I love breaking the egg yolk and have it coat the rest of the ingredients. Last month I received an email from the makers of Magimix to see if I'd like to review one of their toasters: MAGIMIX BY ROBOT-COUPE VISION TOASTER. At first I wasn't sure if I was interested. I have a toaster. I've had it for over 7 years and it does the job. 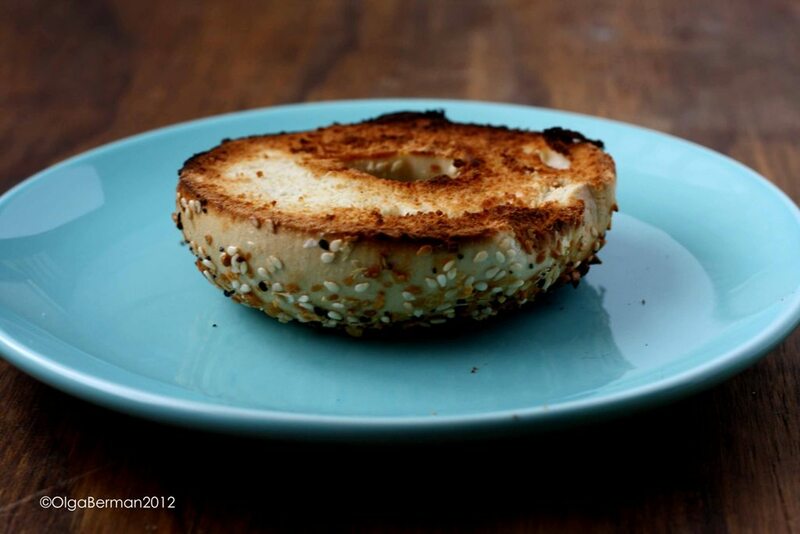 In fact, it toasts bread, English muffins and bagels. And it allows me to toast frozen versions of toast and bagels. 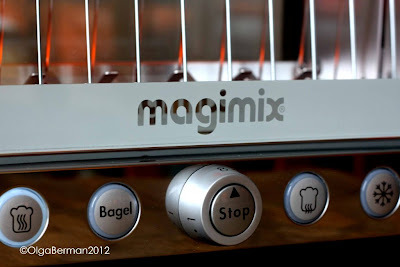 But then I looked at the Magimix toaster and fell in love. 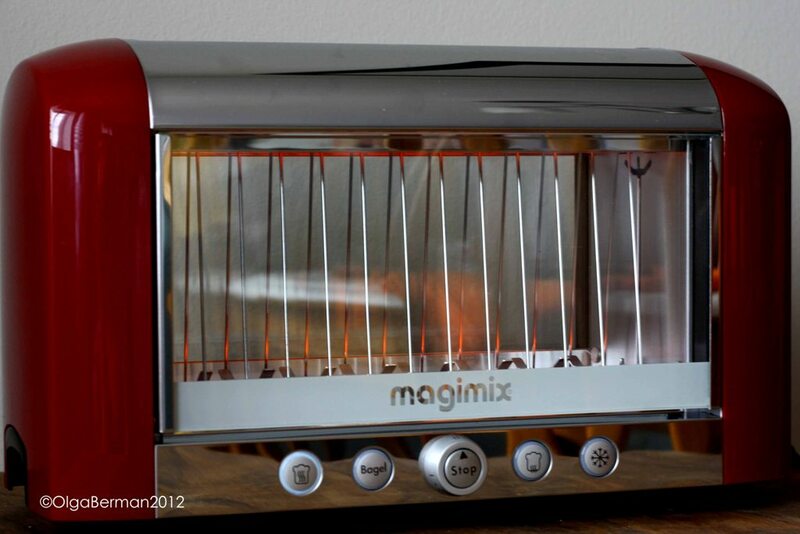 It comes in a shiny red color and it has a see-through window, letting you see exactly how toasted your bread is getting! 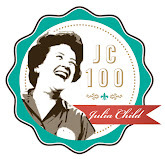 How brilliant is that? Magimix has settings for bagels, toast, frozen toast (but alas not bagel), and an option to reheat already toasted bread. 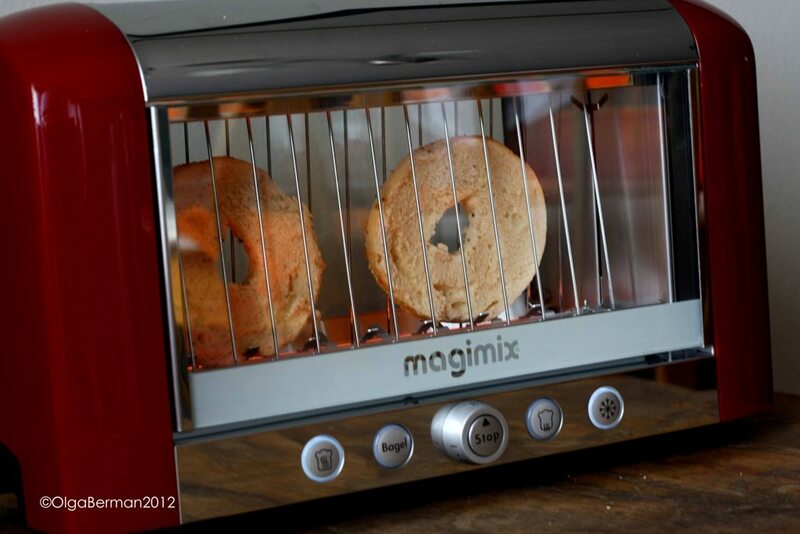 4 heat settings include Toast, Defrost, Reheat and Bagel (one-sided toasting). Defrost function automatically switches to toasting function once defrost is complete. Reheat button reheats without drying out the toast. 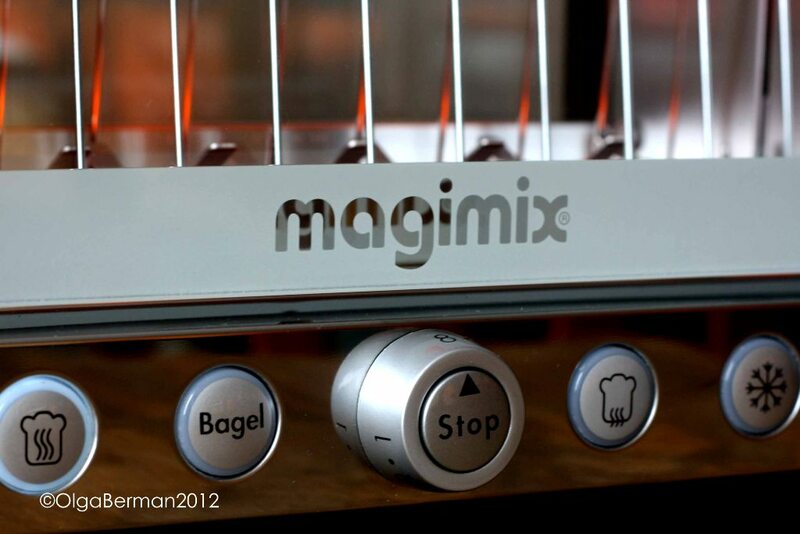 Extra-wide slots accommodate the thickest bagels, baguettes and toasts. Long-life quartz elements provide faster browning leaving bread crisp on the outside yet still moist on the inside. Slide-out crumb tray and double insulated borosilicate glass windows make for easy cleaning and safe use. Durable construction. Built to last for 30,000 uses. Bottom line: this is a great looking and well functioning kitchen appliance! Thank you, Magimix for the lovely gift. I just now need to find a home for my old toaster!! 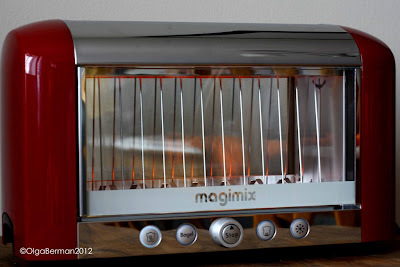 Disclosure: I received a Magimix toaster for the purpose of a review but was not compensated for the review in any way. All opinions are my own. What a gorgeous toaster! Love that you can see the bread as it toasts. Must look for that Sabra Spanish eggplant, sounds yummy! That Spanish eggplant sounds lovely. I think I would have mixed it with Israeli couscous. I don't know how people can have cereal for breakfast either. I'd get hungry once I stepped out the door!